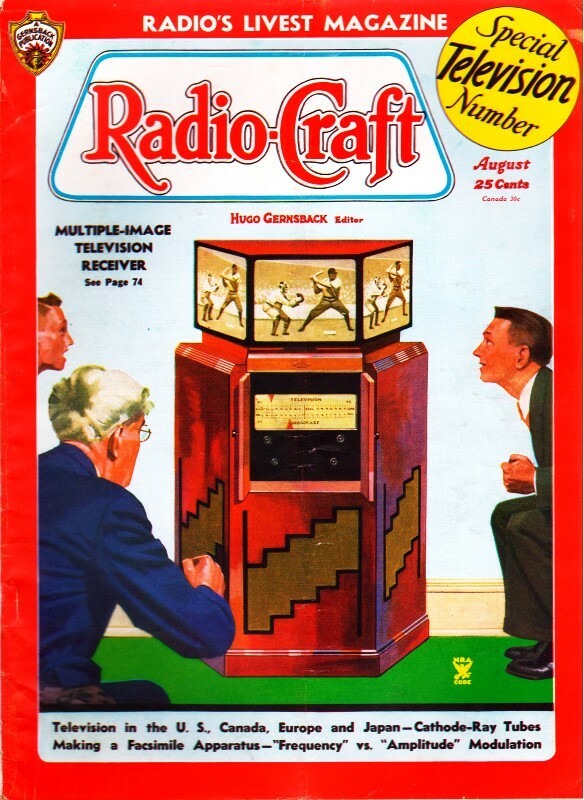 A momentous development that changed the field of radio communications warranted merely a half-page announcement in 1935 when frequency modulation inventor Edwin Armstrong had his article published in Radio-Craft magazine. Spread spectrum modulation / demodulation would be the next big advance. I cannot think of any fundamentally new communications technology since that time, other than maybe the still-in-the-laboratory method of quantum entanglement ('spooky action at a distance,' per Einstein) information transfer. This is an good example of where having access to the original material from nearly a century ago is priceless for gaining first-hand insight. 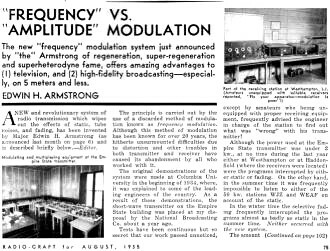 The new "frequency" modulation system just announced by "the" Armstrong of regeneration, super-regeneration and superheterodyne fame, offers amazing advantages to (1) television, and (2) high-fidelity broadcasting - especially, on 5 meters and less. 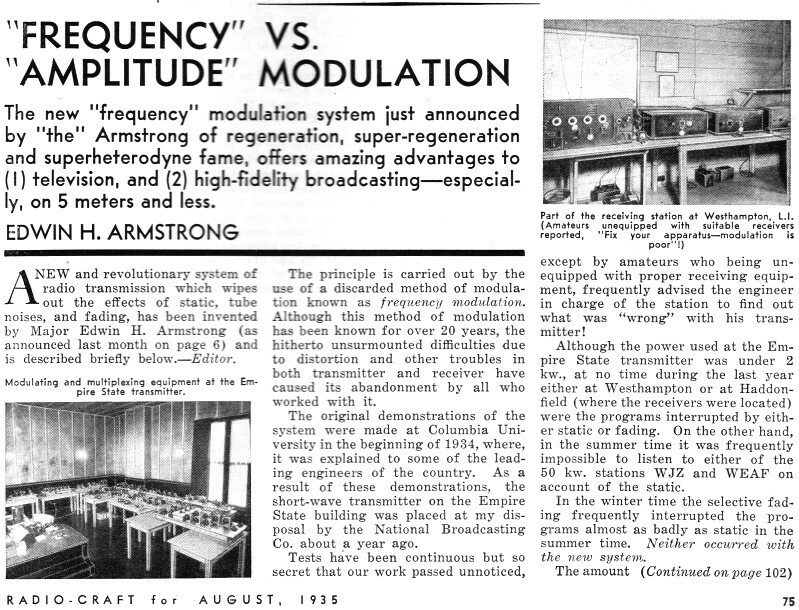 A new and revolutionary system of radio transmission which wipes out the effects of static, tube noises, and fading, has been invented by Major Edwin H. Armstrong (as announced last month on page 6) and is described briefly below. -Editor. Modulating and multiplexing equipment at the Empire State transmitter. The principle is carried out by the use of a discarded method of modulation known as frequency modulation. Although this method of modulation has been known for over 20 years, the hitherto unsurmounted difficulties due to distortion and other troubles in both transmitter and receiver have caused its abandonment by all who worked with it. The original demonstrations of the system were made at Columbia University in the beginning of 1934, where, it was explained to some of the leading engineers of the country. As a result of these demonstrations, the short-wave transmitter on the Empire State building was placed at my disposal by the National Broadcasting Co. about a year ago. Tests have been continuous but so secret that our work passed unnoticed, except by amateurs who being unequipped with proper receiving equipment, frequently advised the engineer in charge of the station to find out what was "wrong" with his transmitter! Although the power used at the Empire State transmitter was under 2 kw., at no time during the last year either at Westhampton or at Haddonfield (where the receivers were located) were the programs interrupted by either static or fading. On the other hand, in the summer time it was frequently impossible to listen to either of the 50 kw. stations WJZ and WEAF on account of the static. In the winter time the selective fading frequently interrupted the programs almost as badly as static in the summer time. Neither occurred with the new system. The amount of noise reduction which can be obtained depends on the strength of the noise. One of the worst disturbances encountered on short wavelengths are the noises due to the motion of the electrons in the circuits and in the tubes of the radio receiving set itself. (See "The Limit of Amplification," in the preceding July issue. -Ed.) On the New York-Haddonfield circuit the energy of this disturbance is reduced to one one-thousandth part without losing any of the signal strength. As the strength of the disturbance increases, the ratio of the improvement becomes less. The effect is something like that of the "tin hat" worn overseas in the AEF - practically perfect against fragments up to a certain size, but not effective against a six-inch shell. The practical utility of the system will be principally on the ultra-short and microwave signaling systems, as the bands of frequency or width of the channel required is greater than on normal broadcast wavelengths. For example, the band width at present used on the Empire State-Haddonfield set-up is about 150,000 cycles. This would not be a practical band width to use on present-day broadcast channels, but it is quite feasible on the 40,000,000 cycle wave used at the Empire State. The range of modulation frequencies which can be transmitted from the best transmission systems today does not extend beyond 8,000 cycles, and only frequencies up to about 5,000 cycles can be effectively used without encountering interference from adjacent channels. On account of the extremely short wavelengths it has been possible to transmit all modulation frequencies from thirty to 16,000 cycles, and to receive them with what engineers call a flat characteristic. The theory on which the problem was solved flies directly in the face of all previous mathematical deductions. The old theory of the way to shut out static assumed that the best that could be done was to narrow the band of the selective systems at the receiver as much as possible without shutting out the signal. By narrowing the band down to a width just sufficient to admit the signal, it was believed that under these conditions the signal-to-static ratio would be the best. Where the signals and disturbances are of the same order of magnitude, I find the exact opposite to be true. With proper methods of transmission and reception, the wider the band, the better will be the signal-to-noise ratio. (This completes all the information that can be obtained at this time from Major Armstrong or Columbia University where the Major is a Professor of electrical engineering. However, Radio-Craft has in preparation some very interesting data concerning modulation in its various forms - especially frequency modulation which is the basis of the Armstrong system. This information will appear in a forthcoming issue. -Ed.